The Ministry Of Peace will begin the process of transforming the modern world’s first imperial power into the world’s leading peace power. The future of our society – and humanity – depends on our success. "Our domestic and international policies would be prefaced and tested by the central question of whether they reduce conflict and violence or increase the risk." Why Are UK-Based Organisations, Cross-Party Politicians, Campaigners and Members Of The Public Creating A Ministry Of Peace? 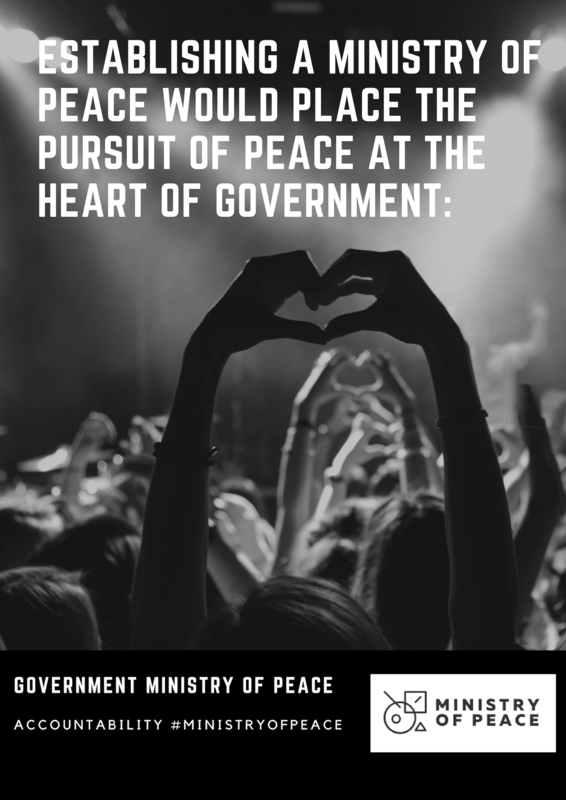 Establishing a Ministry of Peace would place the pursuit of peace at the heart of Government: A new Government Department with the primary function of examining how we can challenge the culture of conflict that has grown up in our society at every level. To empower our children; to raise the consciousness of our communities and our international partners; to ensure that mediation is the first response to conflict. War is not some elemental, climactic force that can defy all control, but something which, being created and prosecuted by humankind, can therefore be eliminated by humankind. The Ministry Of Peace will begin the process of transforming the modern world’s first imperial power into the world’s leading peace power. The future of our society – and humanity – depends on our success. How we can undermine the culture of conflict that has grown up in our society at every level, so that Government could use their resources to educate our children and raise the consciousness of our communities and our international partners to ensure that mediation becomes the automatic response to a problem rather than violence, in the playground or on the battlefield. Early intervention to identify the possible sources of conflict, and the use of education, negotiation, coalition building and reconciliation as the means of conflict resolution, which ultimately results in the replacement of the law of force with the force of law. Our domestic and international policies would be prefaced and tested by the central question of whether they reduce conflict and violence or increase the risk. Identifying the potential for conflict over the scarcity or maldistribution of natural resources, the impact of human rights abuses as a cause of conflict, the potential for reducing and eliminating the arms trade and demonstrating the potential of a variety of techniques for conflict resolution and effective community peace-building activities. A fundamentally new approach needs to embrace the roles of individuals, civil society, national Governments and supranational institutions, in creating the conditions for guaranteeing peace. The aim is to establish a Ministry of Peace, a new Government Department whose sole purpose would be to focus the resources of Government on the promotion of peace and the eventual abolition of war. How Can We Keep Government Ministries Accountable? ﻿Post-Brexit we have the freedom to make our own laws on economics, environmental laws and even create our own social contract to ensure a more peaceful, productive & prosperous society. But who is going to hold the current politically driven Government Ministries accountable so civil society? "Given cross-party support for the Bill, we could begin the process of transforming the modern world’s first imperial power into the world’s leading peace power. Too much depends on our success for us to fail." It is becoming clearer, with great advances in technology, educational attainment, political and economic aspirations that the need for violence and warfare significantly declines. We are global citizens and we share responsibility for what is happening around the world. This change is realistic via appropriate budget reallocation, the simplest of equations: less taxes spent on war, means more resources available to be spent on peace and security. We strongly support the redistribution of funding from offices such as the Department of Defence in order to make this happen, we are confident that sufficient protection for the United Kingdom will continue even with a reduced defence budget. Provide peace-building skills, conflict resolution initiatives, and meditation to school children in classrooms as an elective or requirement, providing them with the communication tools they need to express themselves beginning from Key Stage 1 through to 4.